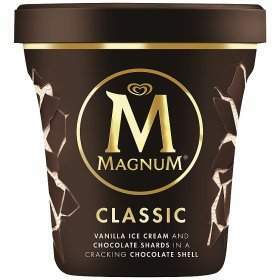 FeaturesMagnum tub classic chocolate ice cream. 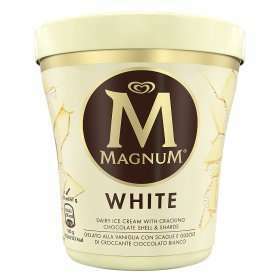 Experience Magnum in a tub, classic chocolate and velvety vanilla ice cream. 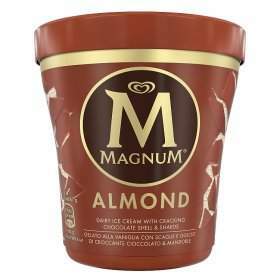 1 ice cream tub x 440ml. Gluten Free. Frozen ice cream to be stored at -18˚C. Magnum chocolate uses Rainforest Alliance Certified cocoa. IngredientsReconstituted skimmed MILK, sugar, CREAM (15%), cocoa butter¹, glucose-fructose syrup, ALMONDS, skimmed MILK powder, BUTTER oil, skimmed MILK powder or concentrate, cocoa mass¹, glucose syrup, emulsifiers (E471, E442, E476), stabilisers (E410, E412, E407), vanilla bean pieces, flavourings, caramelised sugar syrup, colour (E160a). May contain other nuts, soy. ¹Rainforest Alliance Certified™ . 2 for £3 in farmfoods !! !